Pregnancy and Childbirth presents the best evidence for the care of pregnant women to doctors, midwives, students and parents. The logical sequence of chapters and the index give quick access to the abstracts of over four hundred Cochrane systematic reviews. The book serves both as a stand-alone reference, and as a companion to locating full reviews on the Cochrane Library. The Cochrane Library is published by John Wiley on behalf of The Cochrane Collaboration. Director/Hon Professor, Effective Care Research Unit, University of the Witwatersrand, University of Fort Hare, Eastern Cape Department of Health, Frere and Cecilia Makiwane Hospitals, South Africa. Professor of Fetal and Maternal Medicine Division of Perinatal and Reproductive Medicine, The University of Liverpool, UK. Associate Professor, Dept Obstetrics and Gynaecology, University of Adelaide, South Africa. Obstetric Epidemiologist, Institute of Health Sciences, Oxford, UK. Department of Reproductive Health and Research, World Health Organization. Cochrane Pregnancy and Childbirth Group, Division of Perinatal and Reproductive Medicine, The University of Liverpool, UK. Professor James P. Neilson, Obstetrics and Gynaecology, University of Liverpool, UK. The Cochrane Pregnancy and Childbirth Group. Methods for the Cochrane Pregnancy and Childbirth. 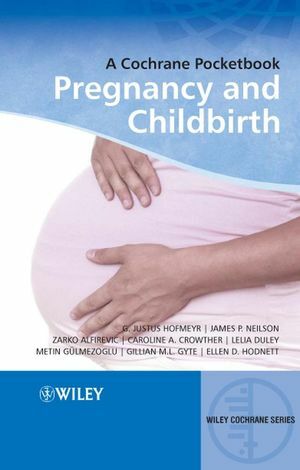 Abridgement of the Cochrane Pregnancy and Childbirth abstracts in this book. How to locate the original review. A brief guide to the format of results in Cochrane reviews. Chapter 1. The Context of Care for Pregnant Women. 2.5 Weight gain in pregnancy. 2.7 Use of medicines during pregnancy. Chapter 3. Medical Problems During Pregnancy. 3.13 Human immunodeficiency virus infection (HIV). Chapter 4. Disorders Affecting the Unborn Baby. 4.1 Routine assessment of the baby during pregnancy. 4.3 Impaired growth and wellbeing of the unborn baby. 4.4 Blood group incompatibilities – prevention and treatment. 4.5 Death of the unborn baby. 5.1 Prelabour rupture of membranes. Chapter 6. Induction of Labour. 6.1 Specific indications for labour induction. 6.2 Techniques of labour induction – primary reviews. 6.3 Techniques of labour induction – secondary reviews. Chapter 7. Care During Childbirth. 7.2 Routine care during labour. 7.4 Slow progress during labour. 7.6 Abnormal presentations and positions of the baby. 7.7 Babies with compromised condition during labour . 7.12 Pregnancy following caesarean section. 7.14 Postpartum haemorrhage and retained placenta. 7.15 Inversion of the uterus. Chapter 8. Care After Childbirth. 8.1 Basic care of mother and baby. 8.5 Medical conditions after childbirth.